Well-rested and well-fed from the day before at the beautiful farmhouse B&B in rural France, I was ready to take on the 75 mile ride into Brussels. Without cellular data, however, I could not stray from the path in front of me that I had loaded while on the Wi-Fi network. Luckily for me, I had learned my lesson of using the cycling route on Google Maps in France and just followed the main roads one would take if driving a car. Considering I was in the middle of nowhere in rural France, I knew the traffic would be light and these ‘highways’ would be the best roads I could find. After a quiet and uneventful 15-mile ride through an impoverished region in northern France, I crossed over into Belgium and the socioeconomic transformation was instant and impressive. On the French side sat abandoned farmhouses and rotting tractors while the Belgium side boasted booming agribusiness and beautiful stone houses that were a perfect combination of traditional architecture with modern style. The roads also instantly improved and I was greeted with a sheltered bike lane! I had not had a dedicated bike lane in France since I left Paris. Can you tell I was happy to leave France? The halfway point of the trip brought me to Mons, Belgium, where I stopped to have lunch and get a Belgian SIM card so I could use data while in this wonderful country. After a few more photos in the beautiful city center, I hopped back on the bike to crush another 35 miles onto Brussels. I absolutely loved cycling through Belgium! The ride from Mons to Brussels along a covered bike lane was such a welcome luxury after slogging through France. Before I knew it, I was in Brussels with a few hours to spare before nightfall. After some sightseeing, I posted up at the Delirium Café to let some of my inner frat boy out by tasting as much Belgian beer as I could knowing I had to ride the next day. Content after a number of pints, I sauntered back to my hotel to get ready for more touristy activities the next day. I woke up still on a high from the beautiful ride from the previous day and the Chargers victory over the Super Bowl Champs! I watched as many highlights as possible as I sucked down close to 2,000 calories over breakfast. With 75 miles in front of me to Romeries, I knew food might have been hard to come by along the French countryside on a Monday (last time I had to find food on a Monday in France I almost passed out, and finally did when I ate 40 chicken nuggets at the only place that was open, McDonalds). After a wonderful breakfast and tour around of the regal city of Compiègne, I pushed off. I had selected the route the night before based on how I was feeling from the previous ride. Energized, I thought I should add to my mileage by 50% or so, and picked a city roughly 75 miles north east of Compiègne. Using the Booking.com app that had helped me find lodging everywhere in Europe, I selected a nice bed and breakfast on a farm in Romeries. Within miles of Compiègne, the canal roads deteriorated into gouged dirty paths, reminiscent of some difficult mountain biking single-track I was used to back home. While fun on a mountain bike, these roads were hellish when on a road bike with 50+ lbs of cargo over your back wheel. I ruptured 2 tubes within the first 10 miles. The second blowout was a bad one and caused a tear to develop in the sidewall of my rear tire. I patched the sidewall with an emergency tire boot kit and prayed it would hold. I only had one tube left in reserve and a patch kit, which I really did not want to use, as they are not as effective when your tire is under heavy weight. Therefore, I proceeded cautiously for the next 10 miles. At the halfway point of the trip, I rode through a beautiful city that shares a name with one of our most notorious prisons, Saint-Quentin. Distracted by the wonderful architecture in the city center, I rupture another tube! I took great care with this repair, as it is my last tube. Nevertheless, within a quarter mile, it blew again. Finally, I realized the sidewall was beyond repair and it would not make sense to patch the tube just for it to blow again. Dejected, with no data in a town that is all but shut down on a Monday, I started walking back to the city center hoping for a miracle. A very kind man named Gary saw that I was in trouble and offered his help in broken English/French. He told me the only store that was open on Monday with bike equipment, was 2-3 miles down the road next to the freeway. He pointed me in the right direction and I started walking. After close to an hour of walking I saw the business park! The sight became even sweeter as I turned the corner and saw that the Intrasport was open, and there was a McDonalds right next to it. Another 20 chicken nuggets would be my reward once I fixed my tire! Inside, I immediately met an energetic Frenchman named Christian who was excited to help, yet spoke no English. I showed him pictures of my ride and pointed to my bike issues and he brought out all the tires they had. With no tire wide or strong enough to carry the load over the rear wheel, I decided to swap the front tire for the back, and buy a decent Continental front tire to replace my destroyed one. I also bought 4 more tubes just in case, before I rewarded myself with a feast of nuggets. With a full belly and working bike, I flew through the remaining 30+ miles to my bed and breakfast in Romeries. I made it just before the sky went pitch black and was greeted by a pack of friendly dogs and warm shower. The next morning I arose to the sound of chickens and a ton of emails. Unfortunately I had a major project come up last minute and had to hole myself up at this B&B until it was finished. This farmhouse was a perfect place to work and I decided to extend my stay another night so I could finish in peace. It took all day and most of the night, but with the valuation project complete, I planned my route to Brussels and passed out. Zack and I woke up early the next day, as he had to catch the bus to Charles de Gaulle Airport for his mid-day flight back to Barcelona. Packed and ready, we wandered around Victor Hugo to grab breakfast. Being that is was a Sunday in France, we should have known that nothing would be open and his bus would be late… Thankfully he barely made it on his flight in time. With Zack and Alex gone, and Angelique at an interview, I rode around the City of Lights one more time to pick up some souvenirs, postcards, and supplies for the next leg of my trip. Despite being the home to the Tour de France, I found that bike supplies were scarce and expensive across the country, so I decided to not buy anything unless it was absolutely necessary until I reached Belgium. Compiègne itself drips with history and I was excited to follow the Regal Route through the forest many past monarchs traversed via carriage from Paris to the ripe hunting grounds of this vacation destination. Further, since I have been listening to The Rise and Fall of the Third Reich, by William Shirer while riding, I was interested to see where the Armistice with France was signed in 1940. Before all this, however, I had to navigate my way out of this modern metropolis. While the hearts of all European capitals are beautiful, I would find throughout this adventure that the outskirts remained the most perilous and rugged areas to ride through. Once I passed Charles de Gaulle Airport, 18 miles north of the city, the traffic let up and landscape softened. The next 30+ miles were absolutely spectacular through the Compiègne Forest. With the trees blocking the wind and sun, I was able to just mash on the pedals and hit an average speed of 17 mph under a full load through the forest. On the outskirts of Compiègne, I picked up the canal system, which brought me to town just as the sun was setting. What a ride! Once at my beautiful hotel on the river in the heart of Compiègne (thanks Booking.com) I took a quick shower and got ready for a feast. Being Sunday, the only place that was open was an obligatory doner kabab shop. Shops just like this one would soon become my most trusted calorie dispenser across Europe as you find them in every city and they are all a cheap and wonderful source of sustenance. Stuffed, I stumbled back to my hotel to watch bits and pieces of the Chargers game as it streamed ineffectively to my computer on the spotty Wi-Fi. I fell asleep on a high note as they took down the Super Bowl Champion Seahawks in impressive fashion! The next morning I woke up bright and early to get some work done while touring Paris. Riding my bike through the city during rush hour was a trip! Especially around the Arc de Triomphe, which is absolute chaos in the mornings. Since I had been to Paris many times in the past, I knew there was no better place to write than at an outdoor café in the Jardin des Tuileries. Talk about the perfect writing muse! Therefore, after filming a few chaotic laps around the Arc de Triomphe, I headed straight down the Champs-Élysées to get comfortable. I spent many hours getting caught up on writing in this magical setting of the Tuileries before Angelique texted me saying she and Alex were finished with work and wanted to meet up. We had a wonderful dinner then drinks with some of Angelique’s friends whom she had worked with at the W Hotel before heading to a very fratty Irish bar. What a crazy scene as we were by far the most sober and classy people at this place. !The night ended somewhat early, as I had to meet up with Zack early the next day. The next day we had a nice breakfast in the Victor Hugo area before work. Afterward, I went to meet up with Zack, who had just flown in from Barcelona. Both of us were intent on finding some moules-frites (mussels with fries), so we wandered around the city searching for nearly 4 hours! Guess this was a great way to sightsee in Paris as it took us to some of the best culinary locations, but we settled with some gourmet sandwiches and box wine in the Sorbonne District. Afterward, we met up with Alex and Angelique at a café for drinks with a few more friends of theirs. We could tell almost immediately the guys there did not want to speak English to us, so we waited for Killian to get there before we left to see if we could get into a one of the “premier” clubs in Paris, Silencio. Surprisingly, we must have seemed like enough of a big deal that they let us in! What and interesting place! Created by David Lynch, this place aims to be the successor of “17th-century Parisian literary circles, the clubs of 18th-century London, the Dadaists of the cabaret Voltaire in Zürich, and the existentialists of the tabou in Saint-Germain des Prés, as well as cultural landmarks like le palace in Paris and studio 54 in New York.” Quite the ambitious undertaking, but we had an absolute blast! The next morning, Zack and I awoke quite hungover, yet intent on doing a ton of sightseeing on what would be both of our last full day in the City of Lights. After a quick breakfast, we walked south to the Jardins du Trocadéro. What a madhouse on a Saturday! The Jardins du Trocadéro offers some of the best views of the city and of the Eifel Tower especially, so we took some time to setup a ton of shots. While filming, we met a group of Irish lassies who were in town to see the Jay-Z and Beyoncé concert that night. They took some good photos of us and we returned the favor. Later, we walked down to the river, ordered a few beers, and drank them while taking a time lapses of the riverboats along La Seine. After a long morning of walking, we again continued our search for moulet-frites on the other side of La Seine. We found a place that served ‘the best in the city’ yet they ran out two hours prior. Dejected, we picked up another bottle of wine and some shawarma (vegetarian for Zack) and made our way to meet up with Angelique and Alex further down along La Seine. The four of us wandered along Port de Saint Peres before taking a bunch of pictures on the Pont des Arts Bridge just before sunset. What an amazing view! I awoke in Gournay-en-Bray disheveled from a fitful night’s sleep complete with lucid dreams of my own demise. Must have been my body’s way of punishing me for subjecting it to 40 chicken nuggets in 5 minutes the day before. Regardless of why it happened, there was no way I would be able to make it the whole way to Paris in one day. Therefore, after picking up a SIM card at the local wireless store that was finally open, I broke the remaining ride into the City of Lights up into two manageable blocks. Recharged after the conversation with those hunters as well as a full roasted chicken & frites, I set off for Pontiose. Not far outside the city, I found out the hard way that Google Maps cannot be trusted in France as the recommended routes many times take you through nonexistent back-roads or through rugged farmlands only to shave of a mile or so. Thereafter I made the decision to stick to the small marked roads as much as possible. Aside from having to dodge an endless stream of steady traffic, the ride into Paris was quite easy and uneventful. However, once I arrived at La Défense on the outskirts of Paris, everything changed. I had been to this major business district before, yet never took the time to traverse it in its entirety and see how important it is to the City. I could not get enough of La Défense, yet had to push on into Paris proper as I was meeting Angelique and Alexandra in the Victor Hugo area for an early dinner. Angelique’s parents were in town and treated us to a wonderful dinner as we all caught up with one another. After dinner, we had drinks and wandered around the beautiful Victor Hugo area and onto Champs-Élysées. What a wonderful way to end my first night in Paris! Considering I did not yet have a SIM card that worked in France, I spent the first part of the morning using the Wi-Fi in the ferry building to plan my ride as well as book hotels for the next few days. I did not feel great at the moment, so decided to only do 40-50 miles that day and booked a place for the night in Gournay-en-Bray. Content with the route ahead of me, I rode into Dieppe proper to see if I could grab a large breakfast anywhere. At this point, it was only 8am and nothing was open in this beautiful port city. Dejected, I rode further on my way expecting to find food along the way. Unfortunately, I would find out later that nearly every shop in rural France is closed on Sundays and Mondays. After the first 15-20 miles, I felt like I was in the Twilight Zone as every one of the 10 restaurants I tried to stop at was closed. My equilibrium was slightly off and I almost fell a few times out of sheer exhaustion. At this point, I told myself I could only go a few more miles before I would be forced to knock on the door of the next house I saw to ask for sustenance. Finally, a large business park materialized on the horizon. Thoughts of a false desert oasis crept into my head, but as I got closer, I was positive that golden arches were coming into focus. I HAVE NEVER BEFORE BEEN SO HAPPY TO SEE A MCDONALD’S IN MY LIFE! Thankfully, this quintessential sign of American-made obesity and excess was open for business in a country that was closed for the day. I parked Bertha out by the children’s play area and immediately dashed in to order 40 CHICKEN NUGGETS! I must have looked a tad out of place here, what with my helmet still on and dirty, disheveled riding clothes. For some reason beyond me, no one could understand my order. Finally, through a combination of sign language and pointing, they realized that I was both crazy and crazy hungry. Finally satisfied with feast in hand, I went back to the play area and immediately crushed 40 nuggets and 2 large sodas. WOOF… Exhausted, I rested my head on the table with my arm around my bike and immediately passed out. I awoke to the sound of children playing, but what language were they speaking? Discombobulated, I looked around; saw the golden-arches, then the play area, and finally my bike. Oh yeah, I was riding my bike across Europe and now I’m in the middle of nowhere in Normandy. I glanced at my watch and I was asleep for a solid 2 hours! Embarrassed yet satisfied I was many miles away from anybody that would notice me, I hopped on my bike and rode away like the place was on fire. There were only 12 more miles to my hotel for the night and I knew I would soon be sleeping like a baby on a trans fats high! I arrived in Gournay-en-Bray around 4pm and everything again was closed. How does anything get done in France! Thankfully there was a corner brasserie that was open for an hour and I was able to get more sustenance before I zonked out for the night. What a day! London to Paris via bike is a quite popular mini-adventure and therefore many websites exist detailing the many routes you can take. I wanted to challenge myself on this first major leg of the trip, and thought 4 days would be ample time to make it to The City of Lights. So, after a hearty breakfast at my hotel (where I instituted what would become a ritualistic morning theft of rolls, meats, and cheeses that would constitute my 2nd meal of the day before lunch) I left London for the 65+ mile ride into the coastal town of Newhaven. The ride started out arduous though as getting out of London was quite the cluster f#ck! Not only is it difficult to navigate on the wrong side of the road, but also double decker buses absolutely run the roads and they stop every few blocks and do not yield to bikes. Further, the city has been slow to adopt bikes as a viable method of travel so their bike lanes are sporadic at best. However, once out of London, the roads quickly widened and scenery changed to beautiful rolling hillsides. After about 30 miles, I decided to stop for lunch at a majestic 17th century inn/pub called The Bell in the heart of the Surrey countryside. Surrounded by a National Park, this pub was an idyllic spot to have lunch outside on a beautiful day. Further, Zach and I had been determined to find the best fish & chips across Ireland and the UK and this place had the best of the whole trip! Stuffed and slightly buzzed after 3 heavy beers, I got back on the road with high spirits on the way to Newhaven. The rest of the ride was beautiful, yet uneventful until I passed Lewes, just short of Newhaven. I kept missing turns in the countryside and therefore ended up in Newhaven just before dark and slightly behind schedule. Since there were only two hours until my ferry left, I made the horrible mistake of not eating before I made my way to the Newhaven ferry terminal. Stupidly, I thought checking in would be a long process like at the airport and I wanted to give myself enough time to shower, charge all my devices, and get situated for the next day’s ride. With all my tasks completed, I looked around for any place to eat. Regrettably, there was nothing in the vicinity. Considering I burn roughly 60 calories per mile, I was at least 1500 calories in the hole with no quality prospects to fill that void. So, instead of attending to my most basic need, I told myself I’d just pick something up on the ferry. Once finally on the ferry, there was little edible fare in the cafeteria (the home port must have been in England, not France). So, I devoured a bag of chips, an apple, and decided I would eat in Dieppe Harbor after de-boarding. Frustrated, I forced myself into a fitful sleep, as I needed whatever energy I had for the next day’s ride in France. I woke up the next morning with a massive Princeton reunions style hangover. However, I had a laundry list of items I had to knock out over the next few days before I could leave London for Paris. First things first, I rode to the nearest bike shop to replenish my provisions of tubes, cables, tape, and other small items I depleted through on the rough ride into London. Next, I met up with Holly (whom I met in Ennis) for brunch in Notting Hill and afterward she pointed me in the direction of the best and cheapest place in the city to do all my laundry. Finally, I stopped off at the Royal Post office to send off some post cards, as well as another 10 lbs of items that I did not desperately need for the trip forward to my cousins in Denmark. While I knew London would be expensive, this day provided an ugly reminder that everything cost 50% more than I was used to back in the States. Guess this is the price you pay to live in what many believe is still the world’s most influential city. Since the Wi-Fi was spotty and slow in my hotel (which would happen often throughout Europe) I finished off the day at a local wine bar catching up on work… how European of me! The next day I holed myself up at a Starbucks to finish all I had started the night before. Between writing a prospectus for one of my consulting clients and planning the next few days of my trip into Paris, more London adventures could not ensue until I got my $hit together! Finally after about 6 hours in Starbucks, my work was done and I headed off to meet up with Steve Williams, a friend from Coronado High School I knew was in town for work. Luckily, he was staying just one stop past me on the Underground, so it was easy to meet up at the station. Once on the Underground, we sat next to a couple girls who looked extremely familiar. After a brief conversation, we found out they were also from San Diego and living just a few blocks from Steve and I in London. Small world! Steve and I were headed to the Shoreditch area of London for dinner and drinks while Amanda and Megan were meeting up with a friends further east on the line, so we made plans to grab a drink later. Shoreditch was amazing, and it’s not just for Hipsters! We met a couple of Steve’s friends at Pizza East, which reminded me a lot of Basic Pizza in San Diego with its industrial, open-air feel perfectly combined with live music, strong drinks, and copious amounts of wood accents. After a few hours of bar hopping, we meet up with our new San Diego friends in a fratty area of London to cap off another amazing, albeit expensive, night in The Big Smoke. The next day, we met up with Megan and Amanda again to play tourist in this great city. After a long NOODLE through Hyde Park, the four of us had lunch in Mayfair with Hesh. Next, we walked along the Thames River to see the Borough Market, Southwark Cathedral, London Bridge, Tower Bridge, Tower of London, and finally “The Square Mile” before heading home exhausted. What a day! But I needed to get a good night’s sleep as I had 70 miles ahead me the next day when I started my trek to Paris. My flight from Shannon to Stansted was early in the morning so I parked the rental car in a designated lot and dropped the keys in a safe box. Considering Jason and I had this beautiful hatchback for over a week at only 13 euros per day, I was a little worried about getting the bill in the mail with a ton of hidden fees. However, as we had found to be the case so many times throughout Ireland, people are there to help and do not wish to screw anyone over. Total bill for the car was only $175! With the car out of the way, I proceeded to get ready to be royally screwed when I tried to check my bags on Ryan Air. I was warned of their policies (much like Spirit in the US) where they charged for everything, including checking in if you don’t do it online. WORD TO THE WISE ALWAYS CHECK IN ONLINE WITH RYAN AIR AS THEY CAN CHARGE OVER $100 IF YOU DO IT AT THE GATE. Luckily, I had checked in online and already paid for my two bags (which were over double the cost of my 20 euro flight) and was good to go. After saying hi to my friends at the airport who helped me when my bags were lost, I boarded the plane ready for the next adventure. Once I landed at Stansted, I immediately realized why no one flew in there. Unless you have your own car, it is near impossible to get into London. I had already made up my mind to ride my bike, but the only way to get to the FedEx office 1 mile away was to take a cab with a minimum fare of 25 euros from the only cab company in the whole airport. What a racket! Once at FedEx, I methodically put together Bertha as I knew I would not be taking her apart again until at least Denmark. Surprisingly, it took me an hour as I even super-glued some ball bearings into the headset and seat-post screw holes so that any would-be thieves would think twice about stealing parts off my baby. Finally together, she looked beautiful, albeit heavy with everything I needed for the trip bundled up on her. I sent off the bike bag, along with a few items I decided I didn’t need inside, to my cousin Kim in Aarhus, Denmark. I figured FedEx was the cheapest and most accessible way, but it was still nearly $160! The first leg of the 50-mile trip did not go very well. Without a SIM card in England, I had to load the map in the airport on my phone to get to the nearest Vodafone retailer 7 miles away before I could head due south to London. Call me a pansy, but I just did not feel safe riding without a phone to use in the case of an emergency. One of the two promises I made with my mom, the other being to not ride at night if I could avoid it. Immediately I got lost trying to find Vodafone. To make matters worse, I found out real soon that I was carrying a few too many pounds over the rear tire. At the first slight bump I blew my first tube and damaged the sidewall of my rear tire. Luckily I had spares, but not a good way to start. Once my new SIM card was in I started feeling better and picked up speed on my way through the canal system that would eventually lead me to London. I had scoped out this route via Google Maps and had done street-views all along the canal system to make sure the roads were good enough. However, seeing them on a screen and riding along them are two different things entirely. These paths along the canal were more like bumpy mountain bike single-track than road. The further away from London the worse they were and the first 20+ miles were miserable. Further, I went through another 2 tubes along the way, leaving myself with only a patch-kit for protection the rest of the way to London. Thankfully, the paths slowly turned into roads and I was able to meander my way into London only a few hours late for dinner with Zach, Aly, and a few other Princeton friends. My hotel was small, but was situated right next to Notting Hill and central to everything. Content, I took a quick shower and met up with my friends in Chelsea. I awoke on the 1st of September in a panic! The 3-day built up hangover didn’t help, but I realized I had been neglecting my “real” job in financial consulting and it was finally catching up to me. My inbox was full with inquiries to why I hadn’t responded to previous requests and I could not push it off any longer. While the Wi-Fi at my hotel definitely left much to desire, I sucked it up, downed a pitcher of coffee and got to work on the prospectuses and valuations I had let build up. Surprisingly, after 6 hours or so, I was done… Guess when you have a serious case of FOMO you tend to get after it. After, I met TJ and Zach at the golf course for a late lunch. What a beautiful place for 18! 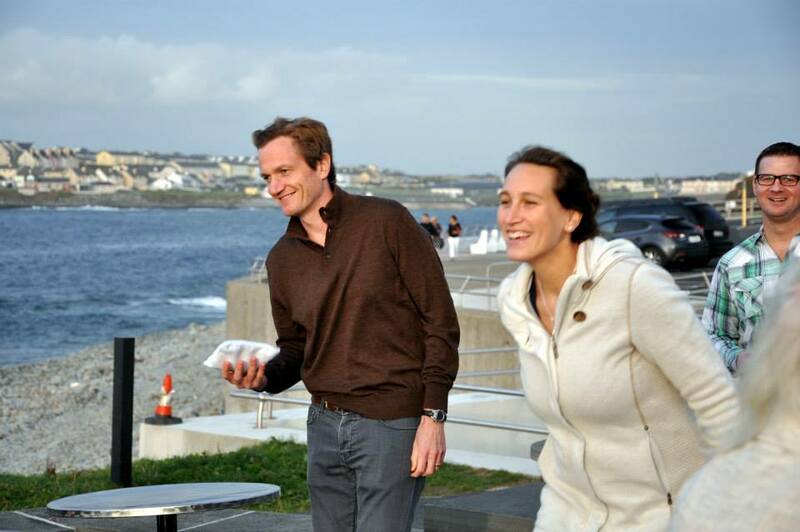 The consensus was that we should all take it easy for once that night and we had one last small dinner with the whole family before Zach, Aly and I prepared to leave for the Cliffs of Moher. The next morning was difficult as we had to say goodbye to these people and this place we called home for the last week. However, the sadness was short-lived as I elated to be the third wheel on a romantic getaway to the Cliffs of Moher with Zach and Aly. While the Ring of Kerry drive had some of the most spectacular views on the trip thus far, this hour drive along the coast was rugged and in many places the road came close to touching the sheer face of the cliffs that dropped over a hundred feet straight in to the ocean. After about 3 hours of noodling around the cliffs, we decided it was time to head back to Ennis, to reclaim my bike and have an early dinner before Zach and Aly had to fly out of Shannon. Considering I wandered this city aimlessly the first time I lost Bertha, I was now an expert on what this old medieval town had to offer and therefore acted as tour guide for the next hour and a half. Before we left, we made one final stop at the Rowan Tree Hostel to get the business portion of my bike that the bus driver so graciously left for me a week prior. Reunited at last, I was ready to get back on the road and officially start this North Sea Adventure! With Zach and Aly safely on their flight, I checked into a motel by the airport (which found that morning on my new Booking.com app) to get ready for my flight to Stansted in the morning and 50-mile ride into London. However, I had accidentally booked this room as well as my hotel in London for next, not this week. Thankfully, Booking.com has agents everywhere and they fixed the issue without any problems. I knew it was an oversight on my end and could have been much worse so I decided right then to use Booking.com for the rest of the trip based on their astounding customer service. Happy that another minor crisis was adverted, I packed up my bike one final time, weighed all my luggage, and fell asleep like a baby knowing I was ready for the meat of my trip to begin! Understandably, I slept through breakfast again since we were up until 5ish. However, its frustrating that I paid $250 a night at this beautiful manor yet did not have the fortitude to go to breakfast either morning and therefore missed out on what probably would have been the best Irish breakfast of my trip! Apparently the manor is used to wedding debauchery and made sure to call every one of us to remind us of the 10:30 am checkout time. Therefore, a major portion of the wedding party crowded the reception area a solid 30 minutes after that cut-off. It was a good thing they got us motivated early though as Stover, Kosh and I all had to kick rocks so we could do a little sightseeing on the way to the next wedding event in Kilkee 110 km away. After an uneventful drive, we arrive at Bunratty Castle to do some site seeing. However, we decide to grab lunch at the local pub instead as it is filled with rowdy Gaelic football fans. Apparently it’s the playoff and we came to the right place to witness this game firsthand. Sadly, I had to limit my Guinness intake to one as I was driving while Kosh and Stover drank their fill. While we ate, we were treated to some beautiful Irish melodies played by three young students. Amazingly, none of them every discussed what they were going to play, rather, one would just start in on some tune while the others joined in only after they understood where he was going. They must have played 10 songs like this. We arrived at Kilkee with a few hours to spare before the Texas BBQ that TJ’s parents were putting on. All rooms were sold out that night so I just tossed my stuff in Kosh’s room and we headed to the bar. Surprise surpise, Kelly’s side of the family was already there, watching the 2nd Gaelic football match of the evening. This game was even closer and, armed with our newfound love and respect of the sport, cheered heartily as either side of the bar yelled for their respective teams. Unfortunately, we had to leave just as the 1st overtime started since there was a Disneylandesque train/tram outside waiting to take us to the BBQ. During this train-ride we all realized how tiny Kilkee is. There are only 2 or 3 main streets in the town and just as many bars, perfect stumbling size for this motley crew. The BBQ was held only steps from where TJ proposed to Kelly and had a wonderful view of the ocean and city as it was perched on the side of a cliff. Just like any respectable Texas BBQ, we played corn-hole (or bags depending on where you are from in the US) all night long. While I could imagine that most of the party was still licking its wounds from the savage night before, everyone rallied. After the BBQ we went directly to the nearest bar where there was quality live music. The dance party that ensued was arguably even more ridiculous than that the day before. What did almost all of us in was the Team American versus Team Ireland drinking games… While most of Team Ireland previously thought they had a W in the bag before all the wedding shenanigans started, their confidence was waning. After 3 straight boat race victories on the backs of Team USA All-Stars Ben Reitz and Shawn Dryden, the competition degraded into just a bunch of yelling and singing. I had a great time with the Irish contingent of the party, including Rebecca Shanahan, John Alford, Barry Dennis, and Greg Clarke to name a few… On our way back from the bars though, we had to partake in some Curry Chips! The next morning I woke up on the floor of Kosh’s room to the sound of his alarm going off. He and Stover had an early morning flight in Shannon so I said my goodbyes and walked down the street to have breakfast with the family. After an amazing breakfast, we all headed out for a dip in the frigid tide pools. Apparently this is the quintessential Kilkee hangover cure as we were all hurting badly from the 3 straight nights of heavy drinking. While swimming in the ocean off the coast of Ireland was not something I originally looked forward to, this was just what the doctor ordered. If anyone is travelling to Kilkee any time soon, I highly recommend taking this plunge! After an hour or two in these frigid waters, we head back to our respective houses and hotels to get ready for a great meal in town for those who haven’t left for the airport yet. We all had a great meal at Naughtons and I retired early for the first time in 3 nights. Beauty and the Beast Get Hitched! I had no doubt in my mind that we would all miss breakfast in the morning after the first of many wedding CRAICs… Further, since I was one of the few people who had a car and was not already running around with my head cut-off with pre-wedding events, I was summoned to make a run into town to grab a bunch of tuxedos. Without much dilly-dally, Cosmo, Blake and I sped off to town to get everything sorted. Since most all of us had the same rented tuxedoes, there was not much more we had to do to get ready than just put them on. Not much latitude for style points but since I would have to carry my tux across Europe on my bike, there was no way I was going to bring my own. We all met up at the hotel bar, naturally, about an hour before the buses left and built up a good lather to prepare for this wonderful ceremony. The bus ride from Adare Manor to Limerick took much longer than expected, as there was a ton of tourist traffic along the one lane road into town. I knew this was not a good sign for the wedding to start on time but how many actually do? Kelly’s family had ancestral ties to beautiful St. Joseph's Church in Limmerick where the ceremony was to be held. When we entered it almost felt like a homecoming for their extended family as the pastor greeted each individual as part of the family. The ceremony was absolutely beautiful and I have never seen a happier groom on his wedding day. No joke, he looked like he had won the lottery the whole time. Rightfully so considering that this one-time house retard and Panamanian hostel owner was about to marry the beautiful, successful, hilarious, and down-to-earth Kelly Whelan. In all seriousness, Turkey Juice, you are the best and you deserve everything that comes your way! Love you man! Tears proceeded to fall all across the pews after they said their I do’s and in traditional Irish fashion, everyone was ready to get drunk. TJ and Kelly did not wait long before manning the Guinness taps behind the bar. They seemed like trained professionals back there as their talents were most likely honed at Montu Taitu. We all had a few drinks before the buses gave us just a couple minutes notice before we had to leave. In the rush, I left my GoPro at the corner store as I was grabbing a sandwich to hold me over till dinner. Just before the bus pulled away, I realized my error and sprinted back to find, much to my luck, that one of Kelly’s distant relatives had grabbed it and was going to bring it to the manor. Seriously, there are no more helpful, friendly and open people on this planet than the Irish! Crisis adverted; we arrived back at the manor and were welcomed with appetizers and copious amounts of free drinks. It is at this time where Kelly’s side of the wedding party started to realize that TJ’s cheeky American friends were ready to embark on a SAVAGE CRAIC even though many of us still didn’t know what that meant. Right before we were called up to dinner, the manor put on a show hosted by its resident falconry team. There were 9+ raptors on display, which we could all “hold,” but the belle of the ball was a juvenile bald eagle named Freedom! Obviously they get a lot of American tourists. Freedom was flown around giving ½ the wedding group a much-needed dose of patriotism in this far away land. The dinner bell was rung right after this Freedom display and we were whisked away to the immaculate dining hall. As expected, I am seated at the rowdy stag table. Typecast as I am, I figured why let them down, so it was time for some drinks. After a few baby Guinness shots with the wedding party, I met Jamie MacKay, who is engaged to Kelly’s sister, Eilbhe. After his initial frustrations surrounding how many times I refer to his coin purse (he is Scottish so was wearing a kilt with a very ornate fanny pack looking belt), he offers me some fine Scotch he brought in his flask. There isn’t much left so I bet him I can get it refilled for free at the bar. Considering its not an open bar anymore he calls me crazy and I agree with him. Little does he know, all I have to tell the bartender is that it is for TJ since he doesn’t like wine and cant get up from the table. The bartenders fill up this flask the whole night for free even though they realize halfway through that I am lying. I have been to quite a few weddings over the years yet this one was quite unique in how both sides, most of whom had never met one another, unified so perfectly under the banner of getting pissed. The dance floor was mobbed throughout the night and we only stopped to take baby Guinness shots together… 40+ at a time! (A baby Guinness shot, if you haven’t had one, is a shooter composed of coffee liqueur and Irish cream that is crafted to perfectly resemble a small Guinness). Since “Shout” was forbidden from the playlist, “Zombie” was played instead. While it’s not the best song to dance in unison to, at that point we were all happy to scream the words to that 90s power ballad till our lungs bled. WHAT AN AMAZING WEDDING RECEPTION! Like all good weddings, it didn’t end there and those who still were searching for the most savage craic headed to the basement bar of the manor. By that time we were all pretty pissed and must have requested Zombie to be played another 5 times. Finally the bar had enough of us and we went to another after, after party in Liz Comerford’s room, one of Kelly’s bridesmaids. We all partied for another many hours until I had to stumble back to my room. We awoke to one of the best Irish breakfasts we had on the whole trip. This 70 year-old inn-keep did everything at the B&B and definitely knew what he was doing. We knew it was going to be a long day so this solid base was a huge help. Immediately after we set off from Kenmare, the views were amazing along the water on these tiny roads. Jason and I could not believe that the speed limit was basically 100 km/h the whole way on the Ring of Kerry. Considering we were in a severely underpowered Skoda, we could hardly get to 80 km/h while maneuvering these meandering roads. I was definitely thankful to not be cycling this part of the trip as we passed enough Audis and BMWs flying through the turns to temper my desire to ride on a shoulderless road without enough space to have two SUVs pass each other. The one vexing potion of the Ring of Kerry was that a greedy and useless landowner capitalized the most beautiful vista on the whole drive. Due to the fortunate labors of his ancestors, this individual fenced off a large swath of land right at the crux of the Ring of Kerry where you would see the immense cliffs and chain of islands in the distance. He was therefore able to collect a beauty tax of 4 euros from everyone who passed. Being the salty individual I am, I asked the man running the entry booth what we got for this fee of 4 euros each. With a straight face, he stated it was to ensure that we had “safe” parking. In the time that we toured the grounds and took pictures, maybe 45 minutes, at least 200 people paid that 4 euro fee, and all in cash! What a golden goose! Jason and I estimated that on the low end (this was not peak season by any means) this ridiculously fortunate landowner had revenues of 8,000 euros per day and only had to pay one ticket taker minimum wage all day! Anyway, I shouldn’t let a little monopoly get me down, as there was still so much ahead of us. We had lunch in Portmagee, which we both agreed had the best fish and chips of our trip so far. We continued to meander up the Ring and finally made it back to Adare Manor after a beautiful and exhausting drive. Luckily for us, once we got to the castle, all of our Princeton friends had time to settle in, so we headed straight to dinner and drinks. If either of us stalled for too long, we probably would have crashed hard. While the wedding party was busy with their rehearsal dinner and walkthrough, our motely crew got pissed at a local bar/restaurant only steps from the castle. After we had build up quite the solid buzz, we headed back to the castle for drinks with the whole crew. I don’t think the hotel staff was prepared for the onslaught this Irish/American party was about to unleash on them as they constantly referred to us as trouble… I made it a point to meet as many different groups of new friends as possible to gauge if my antics of the next day would be deemed suitable, or just belligerent. After meeting a whole host of wonderful people who were hell bent on getting as rowdy as I was, I knew the next few days would be a SAVAGE CRAIC! The night ended somewhat early for an Irish gathering, around 2am, as we all knew there was much to come tomorrow. Also, events started at 10am so there was no rest for the weary. Jason and I both experienced a sleepless night, worrying about our new German friend. However, once we found out everything was ok, we ate a quick full Irish breakfast and decided to head out to experience the Irish countryside. Both of us share the same mindset that enjoyable travel is predicated upon not having too much of an agenda. Rather, it is way more rewarding to figure out what interests you along the way and gravitate towards that. In this vein, we only had a rough idea of where we wanted to go, and zero details were fully worked out. TJ had requested that I put together a bunch of pictures from my computer for the wedding slideshow so Jason and I sat down in the castle drawing room and got to work. What a ridiculous dichotomy! We were belly laughing over all the crazy and inappropriate photos from college in this room where heads of state and dignitaries meet to discuss world events. Quickly, we realize that I have more photos of TJ than anyone else. Mostly because he was typically the center of the party or was doing something absolutely ridiculous. Sadly, we had to cut over 90% of the photos as they were NSFW (not safe for wedding). When we finished, our cheeks and abs hurt from laughing so hard for so long. We dropped off the memory stick and took off to make our way to the Ring of Kerry (Ireland’s most scenic coastal drive). Since we were running out of daylight and battery to navigate us, we departed the park in the direction of our bed and breakfast in Kenmare, known as the base of the Ring of Kerry. As in Dublin, I used the Booking.com app to find our accommodations and would lean heavily on this app in the many days to come during my adventure. Exhausted, we passed out immediately and did not even check out the small town. We knew what was ahead of us and therefore sleep would be a precious commodity over the next few days of the wedding. 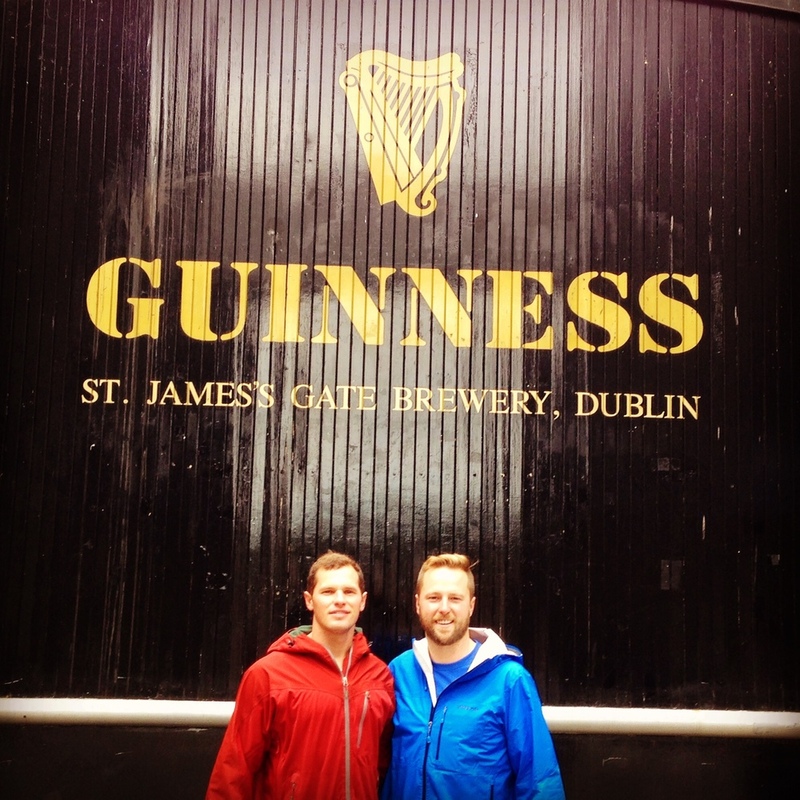 The Guinness Storehouse is on the far side of Dublin and it took us 30 minutes and 2 cups of coffee to make it there. The walk along the river was beautiful, clean, and gave us ample opportunity to get artsy with the photos. After walking for long enough that we both needed a pint, I was just about to look at my phone to see if we were close when this massive compound came into view. The brewery covers over 50 acres in the heart of Dublin and it seemed like all of the surrounding area was dedicated to servicing this tasty juggernaut. After the brewery, we tour more of the city and take in some culture, since Dublin is not only about drinking. Satisfied after 3 or 4 hours of sightseeing, we saunter back to the B&B to get ready for what we hope will be an interesting night. On our way, we pass not one, but 2 top notch live street performers who are straight jamming with big amps and a full drum set in the middle of a pedestrian only, cobblestone street. I cannot stress enough how pervasive and amazing the live music is throughout Ireland!!! When we finally made it to the pub, there was another ridiculous one-man-show on the mic playing just the hits. After just coming from Outside Lands Music Festival in San Francisco, I was amazed that he was playing all recently release rock/indie hits, some of which I had just heard live. The crowd was loving it and singing along as they knew all the words. Jason and I were like WTF, we had no idea these people loved American music so much. The guy played for hours and we partied with dze Germans until the wee hours of the night. We all left around 3am to hit the hay when tragedy nearly struck. After saying our goodbyes to our newfound friends and walking our separate ways, one of the girls passed out as she was walking. Jason saw it firsthand as she went down and hit her head on the side of a building. Immediately we ran over and tended to her. She was unconscious for a few seconds but then completely coherent and awake. As most of you know I have suffered quite a few concussions in the past with lacrosse, water polo, and especially snowboarding, so I immediately ran through the concussion protocol with her. She remembered names, numbers, and everything that went on that night so we try to get her to stand. She couldn’t without immense pain, and then passes out again. This was a horrible sign so I ran to the nearest bystander and had them call the Irish equivalent of 911. Paramedics were there almost immediately and we convey everything that had happened. They say she is in good hands and her friend gets in the ambulance with her. At this point Jason and I could not believe what happened and know we would not sleep very well that night. We received updates throughout the night/morning and find out she will be fine and suffered a mild concussion. Thank God it was not worse! Luckily for me Holly has to get to the airport at the same time as Jason is arriving so we share a cab to Shannon Airport at 5am. I’m somewhat embarrassed as we get in the cab though as I have 4 times the amount of bags as she does, even though I’m still missing one of my most important pieces of cargo. We arrive slightly behind schedule so she rushes to get on our flight while I pick out a spot to assess my current luggage situation. Considering I do not have a complete bike, there is no way I will be doing any riding until after TJ and Kelly’s wedding. Therefore, I imagine it will be best to ditch everything that is not necessary at the airport so I can travel light with Jason and pick up the rest when I fly from Shannon to London in one week’s time. The sight of me with all my worldly possessions shrewn all over the airport must be comical to those at the airport at this hour. However, in this scattered form of organization, I am able to repack only what I need, and leave the rest. I finish just as the main man, Jason Diggs, is arriving and we quickly hop on the bus to Limerick to get a few things sorted before the wedding. Even thought it is Monday morning, it seems nothing opens before 10am in Ireland. Dejected, we grab breakfast and wait for the city to wake up. At 9:30, Tony Connelly’s opens and we get fitted for the tuxes we have rented for the wedding. Next, we head to the nearest bank to change money and find out that there is a bus heading to Dublin in 15 minutes. With everything sorted in Limerick, Jason and I are ready for our Irish adventures to begin and, while on the bus to Dublin, start figuring out what we are going to do over the next 4 days in the Emerald Isle. We find a ridiculously cheap bed and breakfast in the heart of Dublin, so we decide we shall stay there for 2 nights before we rent a car and mob across the country. Once in Dublin, we do a little sight seeing on the way to our B&B. However, we are both so exhausted once we check-in, that we both crash for 4 hours before we noodle around the city. After awaking reinvigorated, we tour the city with a special interest in Temple Bar, the debaucherous part of town. We walk around for at least an hour to get a feeling of the area before we finally settle on a place to have dinner and get Jason his first domestic pint of Guinness. In what has become almost redundant at this point, we are treated to some more impressive live music. Therefore we decide to drink until the music stops and only head to the next place after the soloist played the hits. Just when we are about to leave the pub, I receive the email I have been waiting for over the last 2 days! The manager of the bus charter has the rest of Bertha and wants me to call him! Elated, I pump my fist in the air and run outside to call him. In as nice of a way as possible, he asks me what kind of idiot who is riding across Europe leaves ½ his bike in a bus? I say this idiot and am forever indebted to him for finding her. Apparently, one out of every five cards I handed out ended up on the floor of the bus, and all he had to do to track me down was sweep the isle. Apparently many of the merry Irish bunch were less excited to receive the cards than I was to hand them out, hahaha. He said he left the rest of her at my hostel in Ennis and I can pick her up anytime. Once again, I avoid disaster only by the hands of a kind, wonderful, and giving Irishman (or woman)! I’m on cloud nine and ready for a celebratory Guinness, “cuz its good for you.” The next place we go was highly recommended for its live music as well but I have been so spoiled already that I am only slightly fascinated by this next act. After a few more pints and a bunch of merriment, Jason and I both decide our tanks are empty and we are ready for a good night’s sleep to prepare us for the wedding shenanigans that are soon to ensue. After 14 hours of flying, compete with an 8-hour time change, I arrive in Shannon, Ireland exactly one day from when I left San Francisco. It is 6:30am and I’m beyond haggard, still trying to recover from the epic two weeks in San Francisco. 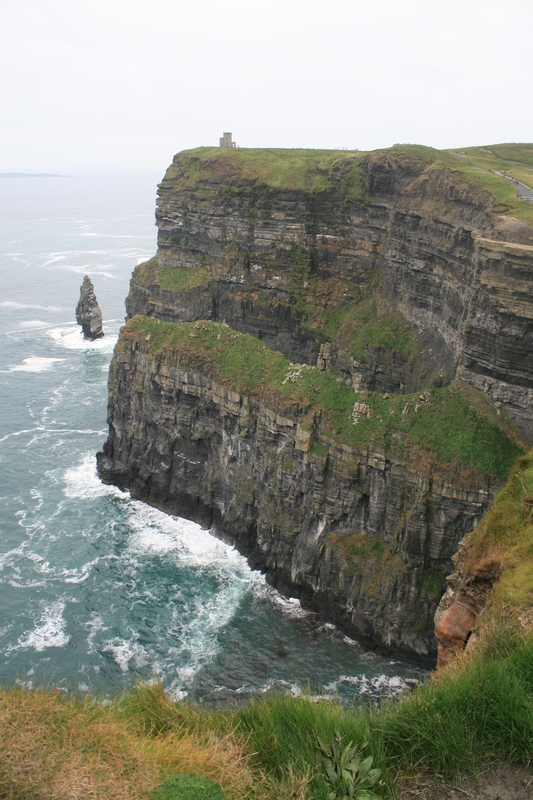 Still, the impending sense of adventure motivates me forward as I have planned a 60 mile bike ride to the Cliffs of Moher, arguably Ireland’s biggest natural draw. All I need to do now is grab some food, assemble my bike, and store everything I don’t need for the week at Shannon airport so I may pick it up when I fly to London. Alas, no bike bag shows up on the carrousel as I’m waiting to go through customs. The feeling of panic, which most all travelers have experienced at one point, engulfs me as I wait for the last bags to roll off. Dejected, I head to the luggage department of Aer Lingus, hoping that they may have some answers for me. The kind attendant informs me she has no idea where my bags are but assures me it is a good sign that both my bike bag and small saddlebag that I had to check are missing together. If it was “just one or the other you should be worried,” she says. As much as I want to embrace her steadfast logic, I realize there is a slight chance my bicycle tour across Europe could be cut short before it even started. Still, since everything was at this point out of my control, I figure the next best thing from a ride would be a nice pint of Guinness… However, its 7:30am now and while the Irish are, well, Irish, there is no way that I could get one at the airport at this hour. Armed with Clare’s recommendation, I take the bus to Ennis and get checked into the most beautiful hostel I have seen, the Rowan Tree, which sits right in the heart of Ennis at a bend in the river. Ennis is a small, yet beautiful city know for its live music and never-ending pubs. After my bags and everything else are sorted, I decide to tour the city to wait for the first pub to open at 10:30am so I can finally have an Irish Guinness, “cuz its good for you!” After a few quick stops to pick up a SIM card for my phone, mobile wireless device for internet, and power converters for my devices, I finally settle down into Brogan’s Pub for a pint or two. After a few glorious pints that taste way better on their home-soil and a proper Irish breakfast, I feel rejuvenated and ready to tackle the day. This enthusiasm quickly wears off however, when I remember that I don't have much to do but wait for my bike and realize I haven't really slept in 2 days. Therefore I decide a good nap is in order so that I can enjoy a Friday night in this great city. 4 hours later, I awake and immediately go down to see what the craic is… (Irish people use craic to symbolize a good time, so it would not be out of the ordinary to say, “oi what a savage craic we had last night.”) The head of the hostel has assured me that I will not be disappointed with the live music in this city as some of the country’s best musicians get their big break locally. Then, he hands me a map of the 30+ pubs in the city, a city no bigger than Coronado mind you, and circles his favorite ones. At the first one he circled, I meet some friendly Dubliners who are down to see what Ennis has to offer. I buy a round and they return the favor and in no short order we are chatting with the band during their down time and they tell us where to go next. At the next pub I run into a group I meet earlier while walking the city. They are locals and say this place only gets good later so we all pub hop across the local spots (all with impressive and intimate musical acts) for the next few hours. Finally we settle into the main place where the most well know musicians go late night. At this point we are approaching 2am. This seems odd to me because everyone told me Irish bars all close at midnight. Apparently the good ones stay open until the music stops and the bouncers just stage a shut in, where they don’t let anyone else in and close the doors. If a police officer walks by and asks if they are open they say, “no we closed at midnight.” Despite the obvious loud music coming from inside and the apparent fire hazard these closed doors could create, the officers are contented, most likely because they are playing there later in the week. After a savage craic on my first night in Ireland, I decide it’s time to head back around 2am. I know there is more of this to come, especially considering TJ and Kelly’s wedding is coming up in less than a week. Apologies to those expecting an immediate account of all events pertaining to my North Sea Adventure, namely, my wonderful mother Ruth-Op who goads me almost daily for photos and information regarding my trip. Further, while this journey was meant to be heavily cycling centric, the reason I came out the first place was to witness the wonderful nuptuals of TJ Edwards and Kelly (last name yet to be determined) Whelan. Therefore, this first part of my tour of Northern Europe does not include much cycling as Irish weddings involve copious amounts of drinking and eating and altogether merriment. Additionally, for reasons you are soon to find out, my trusty stead named BERTHA had a rough time in Ireland and barely made it into and out of the country. My bike and mind are now both finally sorted and the blog can therefore commence… I dedicate this ride to the two adventurous spirits who have instilled in me the sense that the world whatever you make of it and that fortune favors the bold. I love you both immensely Dr. Jay and Ruth-op!